Thanksgiving Trading Hours - Are You Prepared? 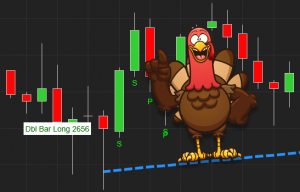 Thanksgiving Trading Hours – Are You Prepared? Have you traded around holidays or during half-days before? Watch out for slow or erratic activity. Big market movers and automated systems may not be as active. Apply an ATR (Average True Range) with a period value of four to get a more realistic view of current volatility levels. As we proceed into the final weeks of the final quarter of 2018, the markets are temperamental. In recent days, news outlets have covered the fallibility of tech stocks, particularly Apple, which saw a significant fall around Nov. 19, 2018. Facebook’s CEO Mark Zuckerberg appears to be the subject of much controversy, with his leadership competence in question as well as the platform’s privacy controls. Jeff Bezos, Amazon CEO, said within the last week or so that Amazon will fail one day. Do you agree with analysts that say Amazon is a better long-term investment than Google, Apple, or Facebook? As we move into the final weeks of 2018 with holiday shopping intensifying, we will see if there are any more “leaks” with real or perceived pressure. If you trade the E-mini or similar CME equity indexes, note the Dec. 13, 2018 roll date. On that day or soon after, roll over your futures contracts to 03-19. Otherwise, you will see your charts “dry up.” And of course, expect further market closures later in the month due to Christmas.